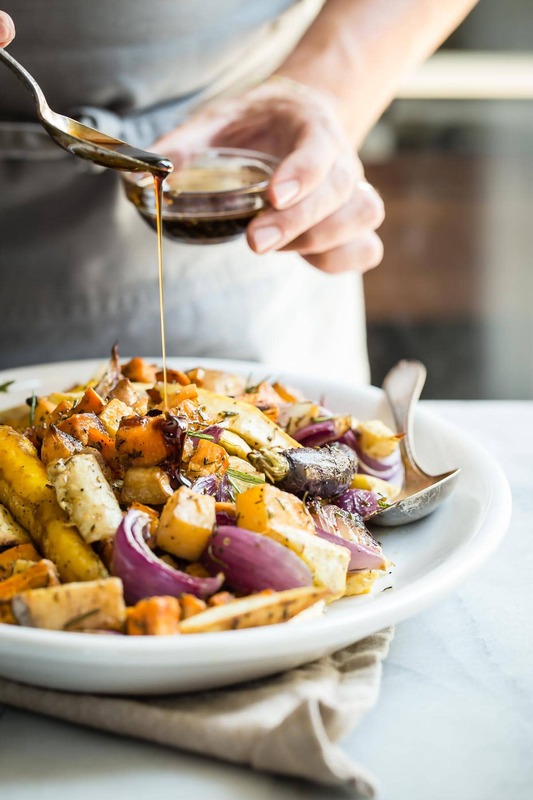 Balsamic Roasted Vegetables with rosemary and olive oil, then finished with a drizzle of maple balsamic reduction. These vegetables are a must for your Thanksgiving table or next dinner party. Quinn: Blank stare. Picks nose. Miranda: Looks at me with a raised eyebrow – “Roasted?” Like I had invented some new word. Quinn: Looks at his sister for some advice. This unscheduled food experiment was a success and they loved them. To be fair, they’re not just some glorious root vegetables doused in sweet maple syrup. In fact, they don’t taste much like syrup at all; the sweetness comes mainly from the roasting and all of those crunchy charred bites. 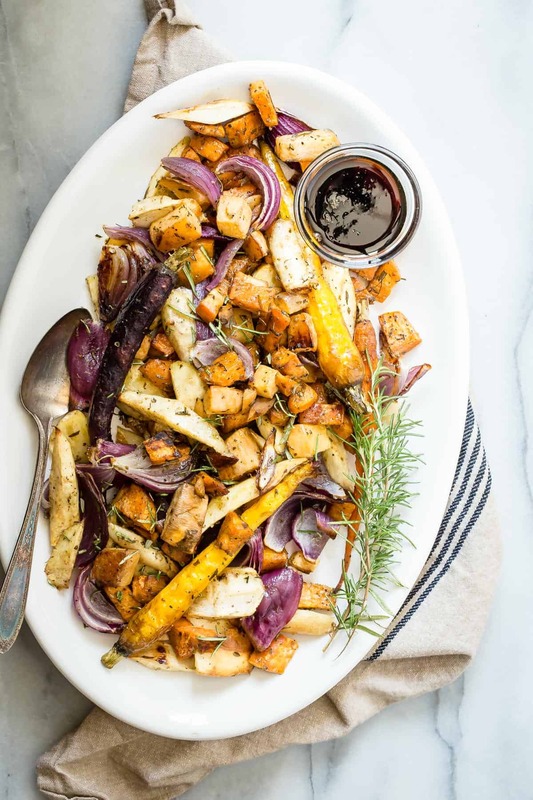 The maple syrup is mixed with balsamic vinegar and reduced to a mildly sweet and savory sauce, but most of the flavor bonus comes simply from the roasted veggies. I have a friend who recently commented that her daughter had asked for leftover roasted cauliflower in her school lunch box… score! Another surprising thing was that I almost didn’t have any carrots left for this recipe. The kids found them in the refrigerator yesterday and thought it was hilarious to walk around eating them Peter Rabbit style because they still had they still had their green tops on them! One more kid-friendly veggie tip: I’ve noticed that if I let the kids prepare and cut the vegetables, then they become more interesting for them to eat. Sometimes the veggies don’t even make it to the plate! Vegetables roasted with rosemary and olive oil, then finished with a drizzle of maple balsamic reduction. These vegetables are a must for your Thanksgiving table or next dinner party. In a large bowl combine all of the vegetables. Add the oil, salt, pepper, herbs and rosemary and toss to coat well. Place the vegetables on a large roasting pan or two baking sheets, making sure they are all level and not on top of one another. Place in the oven and cook for about 45 minutes, checking that the point of a sharp knife spears the vegetables easily. When the vegetables are cooking in the oven, place the maple syrup and balsamic vinegar in a pan and bring to a boil. Reduce the heat and simmer slowly until it has reduced by about half and is nice and thick. Once the vegetables are ready, lightly drizzle some of the syrup over them and return to the oven for 5 more minutes. Serve warm or store in the refrigerator until ready to use. Only add as much syrup as you desire, keeping any leftovers in the fridge. If the syrup gets hard like a caramel and is too stiff to pour, gently warm it in the microwave or stove top for about one minute. It's a good idea to gently move the vegetables around on the pan about half way through cooking to ensure even cooking. This recipe makes a lot and can easily be halved, keeping the syrup reduction for a later use. Cooking time may vary depending on the size of the cut vegetables. Beautiful. I’m such a fan of roasted vegetables. They’re like candy and so nice with the added maple syrup. *Pinned! I love roasted veggies, I could easily inhale the entire pan! I don’t usually add sweetness to vegetables, but this recipe looks fabulous! I adore roasted veggies, Gerry…roasting makes them taste so much better! Love your selection of veggies and the addition of the balsamic and maple syrup! Gorgeous! Haha…I love your kids’ reaction to these veggies….too cute! 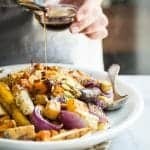 I’ve never made roasted veggies with maple syrup but cannot wait to give it a try! This is 100% the kind of food I love to eat. I could devour this whole pan. My kids would love it too. I love how rustic these look! The perfect fall veggie side dish! These look INCREDIBLE! 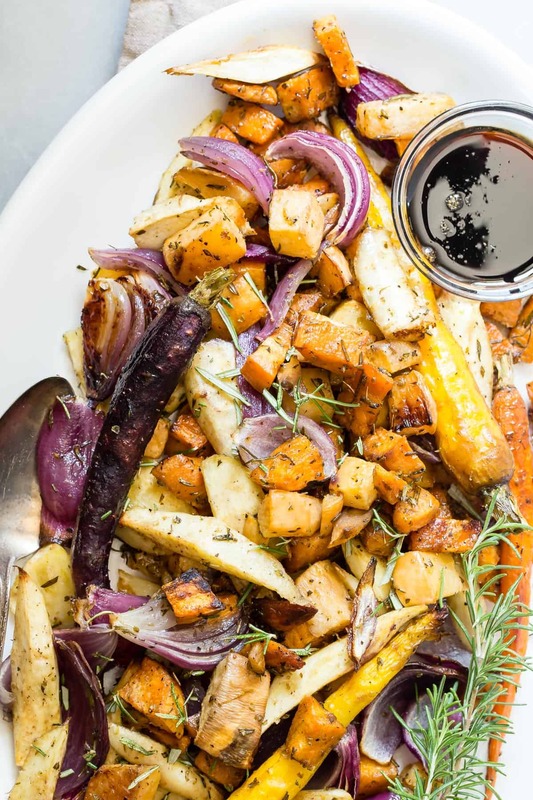 I have no doubt I could eat my bodyweight in roasted vegetables … especially if there’s maple syrup AND balsamic vinegar involved. YUM! These will definitely be around at Thanksgiving Kelly! Pinned these gorgeous roots right away. This with a smoked turkey breast….gonna happen. I love the maple syrup aspect to the root vegetables. I can just taste them from here! Btw, I love your stories, they crack me up!! I’m sitting here snickering! i can’t believe that maple syrup + vegetables has never occured to me before?! i’m DEFINITELY going to give these a go this week, thank you! Made it tonight for thanksgiving, turned out delish. Thanks for sharing! I made these for Thanksgiving dinner- they were a HUGE hit! Thanks for the awesome recipe. Awesome Heather, I’ll be making them for our Thanksgiving for sure! I made this tonight for guests and it was a big hit! Now on to conquer the caramel pumpkin bark. We made this for a Christmas dinner side today. It was easily the most delicious food on the table! Thank you! Awesome Rose, I love those veggies! Thank you! This was an amazing recipe and is a great use for all of the maple syrup we’ve amassed living in New England. WOW. I was SUPER excited to make this recipe for Thanksgiving as my 17 month old is CRAZY for root veggies, and with me on my second pregnancy now I suddenly like beets too (which I realize weren’t in your recipe but we subbed them out for the rutabaga.) My husband was NOT excited at all as he doesn’t like any of the veggies except for carrots and onion. For he, my mother (a carnivore, and we are vegans) myself and my 17 month old THIS dish won the favorite of the Thanksgiving feast…beyond biscuits, potatoes, stuffing and a fabulous lentil walnut loaf! My husband said he LOVED the veggies and even loved the parsnips (which he claims to otherwise hate.) I did mess up and add the balsamic vinegar and maple syrup to the veggies BEFORE putting them in the oven, but the flavor was still excellent. Next time I won’t skip a step, but follow the directions completely. EXCELLENT recipe, we’ll definitely be doing this for Christmas now too!!! I’ll post a review soon on my website and thank you for sharing this! This we delish! I altered the veggies to what I could find or had on hand and halved the maple syrup/balsamic glaze which I thought was sufficient. A crowd pleaser for those who love veggies! Thanks Lisa, I love it when a plan works out! The ultimate side dish for the holidays!! This is my favorite side dish!! Gerry, these are just stunning! I could eat the whole platter myself! I love adding balsamic to veggies! Great idea to roast. 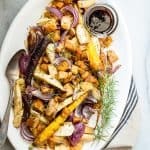 my favorite way to roast fall veggies! I do maple/balsamic all the time! I love that there’s herbs de provence in here too, I’m obsessed with it.